Zeropark is constantly trying to provide the best user experience within our platform, that’s why we are happy to announce some updates to the Rule-Based Optimization! Up until now, you could only apply actions on the Target/Source/Geo level. The newest update brings you the possibility to pause an entire campaign if your criteria are met. Once this is set up, just choose your ROI/CR/eCPA/Conversion condition. 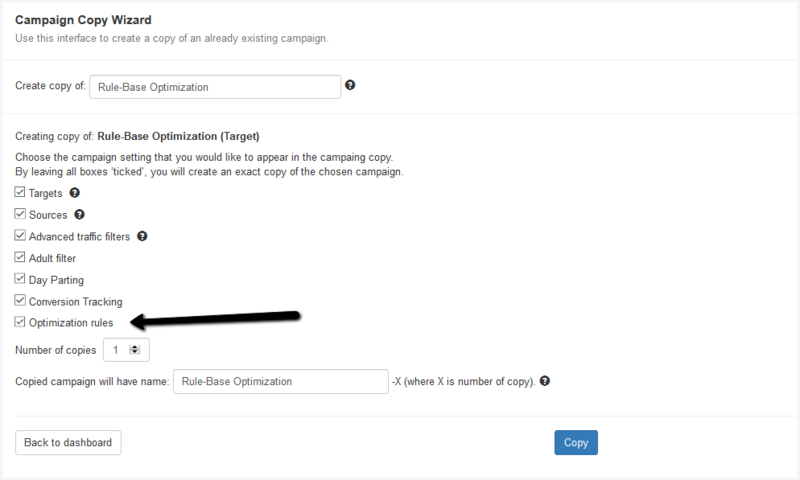 The campaign will pause automatically if it meets the rule you specified. Bid up/down rules were created as the first set of rules you can set for your campaigns, and now they received a small update. You can set the border for your bid, and the system will automatically stop performing the action upon getting to this border. It may seem like a minor fix, but it has tons of use-cases. For example, having this border for Bid Down rule will prevent you from not receiving traffic from targets at all due to the low bid. On the other hand, having the top border for bidding up will save you from overspending on profitable stuff and having excessively high bids. Forget the times when you had to adjust your rules to one particular statistical period, losing the efficiency of some rules just to win some space for the other. From now on every single rule is customizable! Our algorithm will check the stats you want to take into consideration for each rule differently, and perform the coordinate action. All you need to do is to set a correct interval, and you are good to go! So how will it help your campaigns to grow? If you want to pause ineffective targets, it is better to use the longest statistical period possible to prevent even smallest placements from wasting your money. However, the bid actions should take only the smallest time periods into consideration, to see if the action had brought any changes to your campaign.